This MS Awareness Blanket is ideal for lounging around the house, traveling in the car or taking along on picnics with friends and family. Each awareness throw blanket spreads awareness everywhere you go. 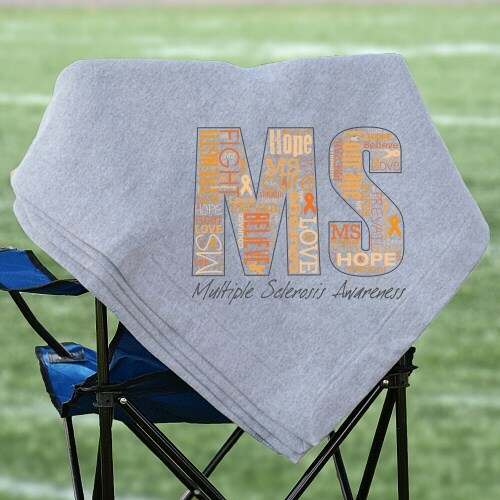 This MS Awareness Blanket is a 50/50 cotton/polyester, 9.3 ounce fleece blanket. Double-needle stitching and Standard Ultra Blend® label. Stadium Blanket measures 50” x 60”. Great as Multiple Sclerosis Gift Ideas for a walk or fund-raiser, too! Today’s Price: $30.99 Only 10 left!